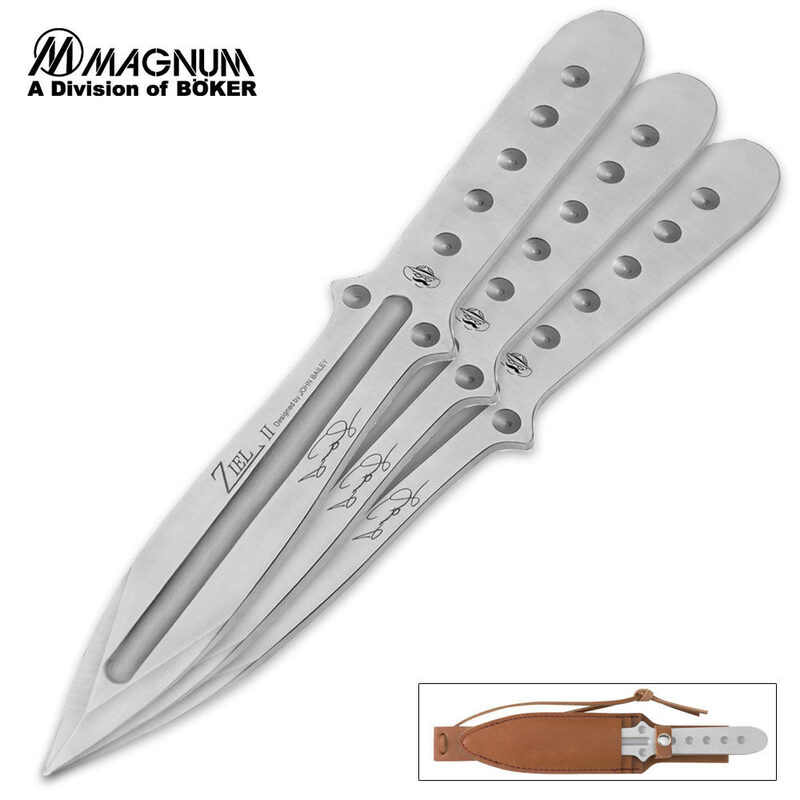 Boker Magnum Ziel 3 Piece Throwing Knife Set | BUDK.com - Knives & Swords At The Lowest Prices! Enjoy Boker's legendary quality in these premium stainless steel throwing knives. Each one is carefully crafted to the highest standards, guaranteeing years of throwing fun with this three-piece throwing knife set. Got the bokers at $69.95 and they are tuff, tuff, tuff. I had 3 Grandsons and a nephew throwing them over and over again and they are still in great shape. For the money the best throwing knives you can get. 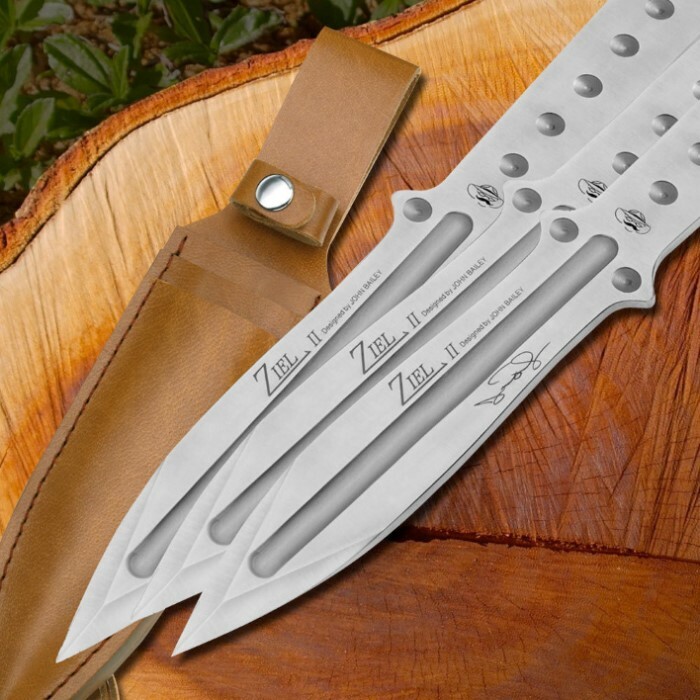 I got the Hall of fame throwers of Gil Hibben and one broke in less than 10 throws. Another one broke that same day. I broke 2 the first day I got them. I guess they were made for someone who sticks them up every time. Customer service was great but I decided to accept the fact that I just wasn't good enough to be throwing that knife. But with the Bokers It doesn't matter. I had a fear of them braking but I no longer have the fear, they are GREAT! for whoever beginners or Pros. I will definitely be buying some more if these ever wear-out. I have two sets already the oldest being two and a half years old and were my first set of throwing knives. With that in mind they took a beating as the learning set but still all three remain perfectly intact despite the battering throwing knives are subject to. Emory cloth, wet and dry sandpaper is all that's really needed to clean them up and a basic bench buffing machine as a extra helps to keep them looking nice. I've collected many sets of throwing knives from various sources and mfg's and must say these Bokers are really top shelf items. Sturdy like you wouldn't believe. I can't recall seeing anywhere anything written about one breaking although I'm sure they can be. Would really have to do something extraordinary to do so IMO. I've had other throwing knives break that were in the higher end group price wise as these Bokers and in each case it was because of the so called "Balance Holes" drilled or however done placed in the handles. The Bokers do not have holes all the way through and I attribute that to their longevity as well as the material they use. A hole all the way through serves one purpose only and that is to create a weakened area for job security planned obsolescence. Think of the hole in the handle the same as a perforated sheet of paper that is the tear off line like on a ticket stub or checkbook. Saying the holes are for balance is a need to wear hip waders it's so deep. Every broken knife I have is at the first "balance" hole next to the blade and I've broken about 7 knives+ so far. But these Boker Magnum Ziel II are the positive example of the phrase "You get what you pay for". To plug BudK you can get the best deal on them with shipping at BudK using a coupon code over any other on line site I know of and why I'm here today...to buy another set. Not that I really need them but it's Christmas and will be my show off set. No I'm not the greatest, I'm pretty average actually but I do have an amazing amount of fun tossing blades. These are the best thowers I own. Expert design in the tip allows sharp point with out becoming to thin. Great sheath, works well. I throw at green pecan tree rounds. This is a fairly hard wood. I throw them by the blade and the handle and have not broke or bent any tips. Some say these are for heavy handed or hard throwing and sometimes I do throw hard. Throwing at about half the power I can I'm getting one inch penatration on the pecan targets. Throwing at a target designed for broadheads six to seven inch penatration is common. Some will shurly say the knives are not sharp but they are properly sharpened for throwing this prevents damage from acuring quite so easily if you accidently hit one of your knives. Great all around thowers. BUDk thanks for stocking the 3 piece set. The Boker Magnum Ziel is the ideal throwing knife for me for several reasons. I need a straight handled knives, with good length and heavier weight, and these knives have all of that. The longer knives with their slower rotation are easier to throw for a good stick. The weight ensures deep penatration of the target. Other knives I have thrown require a light finessed cast, where this knife favors my style of a very forceful throw. The harder I throw it the better the result. I would get a bigger heavier knife of the same design if it were available. I got five of the small knives from Throwzini. They were very accurate but are now all banged up because I threw all five into a playing card. I bought the large knives set from Budk. Budk has the lowest web price and the fastest shipment. Also, products always arrived in good shape and brand new. The same can not be said about other sellers on Amazon. As expected, the large knife has more range than the small one. Accurate from 25 feet away. It's size and weight make it a legal thrower for club competition. Most people bent the tip and said it's too thin. Truth be told, most throwing knives' tip will bend from a miss throw or hitting the wood at an odd angle. Don't ask how I know but so far I have yet to bend any of the three knives in this set. While these are not professional knives made from spring steel, they are nonetheless a great value from a price performance stand point.